Here you will find many of the major local projects that RotarySwimarathon has supported over the years. If you have a good local project which you are seeking support for, why not apply for a RotarySwimarathon grant. Your organisation could become one of the hundreds of local good causes that has been supported with a RotarySwimarathon grant. Grant presentations are held in June each year. To apply for a RotarySwimarathon grant please log in to the website and click on the GRANT APPLICATION link in the GRANTS menu. 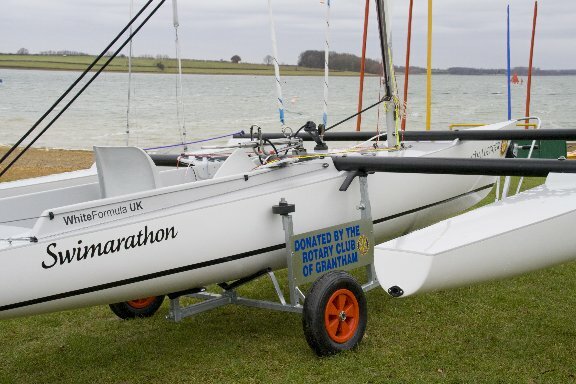 Pictured here is a new yatch at Rutland Sailability being purchased by a Rotary Swimarathon Major Grant. The boat is fully equipted for disabled sailors and will be used in competitions.